We’re excited to be involved in a range of civil and structural engineering projects across New Zealand. You can find out more about some of our recent projects below. Wallaceville is a 700-lot residential and commercial development just north of Trentham Racecourse in Upper Hutt. We've carried out the civil engineering design resolving the site’s infrastructure constraints along with project management, construction observation, and completion reporting allowing the 63ha former agricultural site to be redeveloped for residential and commercial purposes. Our design works have included earthworks, roading, wastewater, stormwater, water, power and phone layouts, as well as the overall masterplanning of the site. There are currently 163 lots completed across the first 4 stages at Wallaceville Estates with another 87 under construction in stages 5 and 6. We are currently designing the next 2 stages. Envelope have been involved in this ongoing project since mid-2016. The Erskine site has over 100 years of history as a former convent and girls boarding school. 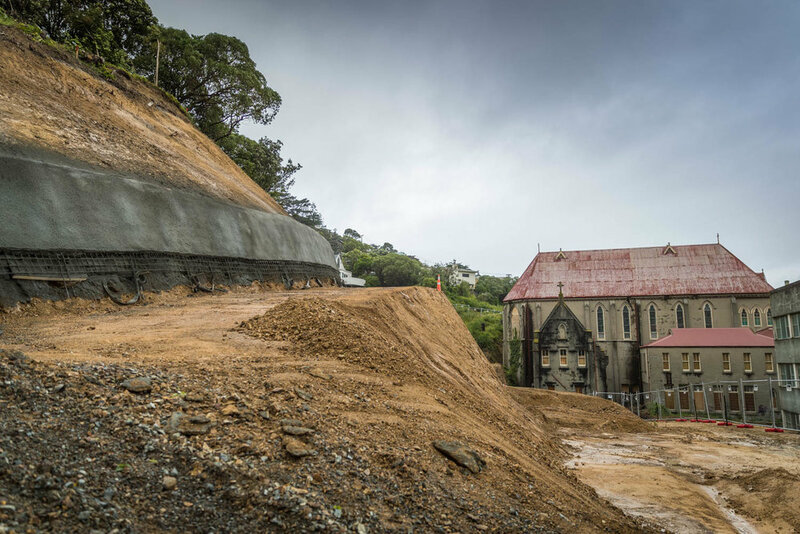 The project includes restoration of the French Gothic chapel and grounds as well as construction of 97 residential houses including standalone dwellings, terraced houses, and apartments. The site, held by The Wellington Company Limited for over 18 years, has been the subject of much debate and conjecture over the future of its heritage assets and finally we see the site being developed providing a balanced approach to heritage and developing a high quality medium density development. We are proud to be part of the project team redeveloping and restoring this site. Redevelopment involved overcoming a number of civil engineering challenges including the steep topography of the site, existing heritage features, existing public drainage and downstream infrastructure capacity problems. We worked closely with the design team to overcome these challenges with Resource Consent being obtained in 2016 and construction commencing in 2017. Envelope have been involved in this ongoing project since early 2016. We helped Geppetto Properties Ltd to realise their plans of converting their Wellington CBD warehouse into three new commercial tenancies. We completed a seismic analysis and designed a strengthening scheme for the warehouse. In addition, we completed the structural design of various structural elements including a new slab step down to allow direct access from Jessie Street, openings in the existing precast concrete panels, a full height glazed wall/window around the stairwell, a steel stair case with glazed balustrade and a fire wall. This property is now a thriving hub of commercial space, and Geppetto Properties are delighted to be providing premises which draw new businesses to the area. Need a structural or civil engineer? We'd love to hear from you. Get to know our friendly team of civil and structural engineers.